Having everything set up this week has actually made me a bit more determined to get the hang of machine knitting. I’ve joined a very friendly Ravelry group who have been really helpful, and with a bit of practice I’ve got the hang of threading the machine correctly. I think this was why I was dropping stitches – and today I even managed to pick some back up again! 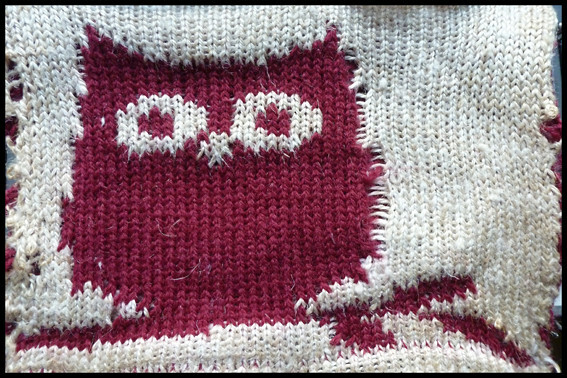 Here’s owl no.3 – looking slightly better than my first attempt, although he’s a bit scruffy as the colours have laddered slightly. 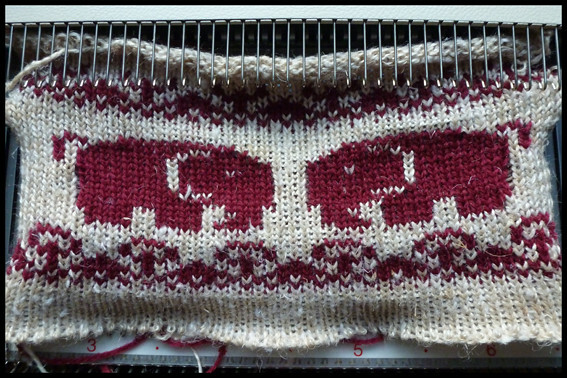 I’ve learned what caused this now – that the contrast colour also needs to go all the way to the edge of the knitting, which wasn’t something I’d considered when programming in the picture. So rather than the stress of re- programming the image, which I think I’ll put on hold for a bit, I thought I’d have a go at some of the patterns already in the machine. I’m definitely finding using the knitting machine easier with practice – like all new things I suppose. I even found I was looking at patterns for jumpers (I’d like a nice lacy one please) but had to slow myself down. This entry was posted in Arts and Crafts, Machine Knitting and tagged brother KH965. Bookmark the permalink. I’m so proud of you! I don’t know which I like the most, the owl I think. I don’t know anything about these machines, do they go quickly? What can you make with them? Is it just to have a change from hand knitting or are there things the machine does that you can’t do by hand? Glad to see your progress. Have a happy day! I bought two knitting machines when my friend was working for a charity shop got them in. I wanted them so I could create fabric quickly to make things to sell, as knitting by hand is too slow to make any money from it. There are lots of videos on youtube of them working – once they are set up you can knit really quickly on them, but it feels a bit soulless to me as it isn’t the same as hand knitting. Having said that, you can’t see the pattern growing as you work from the wrong side, so it is quite exciting to take it off and see what you’ve created! I just commented and I see that there is a link to my last post! How cool is that!? What is the awesome new feature you’ve added? I would love to have such a handy way to share posts. Would you mind telling me/us more about it? Thanks! Yet another reason to consider moving to WordPress. Weebly just doesn’t make it easy to customize – or offer neat features that make blogging fun. I keep waiting for them to ramp up their services, but it doesn’t seem to be happening. Sigh… Was it hard when you made the switch? I like the way my blog looks and I hate the idea of starting over. I prefer it as I have a lot more control over how things look now, plus there are lots of little cool plugins you can use such as link within and Yoast for SEO. It was a bit of a faff to move over – my old blog is still live at http://www.buttonsandbeeswax.blogspot.com if you want to see what it looked like before. My host told me it was best to start a new one and keep the old one there, rather than move everything as google doesn’t like duplicates. Which meant I could still keep posting while working on the design of the new one – however I did find out the hard way that you need to find a host first, then build it, rather than the other way around! With free wordpress you are really limited with plugins and how you want it to look, which is why I opted to pay in the end. I love them!!!! I am so jealous! Tonight I used up some of my gemstone stash…can’t wait to take pics and post them tomorrow! Gorgeous – looking forward to seeing them! They are wicked!!! The owl has improved a million times! Love the rams as well. You have a new follower. Thanks for stopping by my blog and commenting. I love your creations. You are really a talented knitter! I have never used one these machines before, it looks like a fun thing to try. Currently I am going through a “dry spell” of yarn creations, but hope to change that . And I am also packing up our home of 13 years and relocating to another state about 15 hours away (driving). Hope to leave by July. Happy mid-week! Good job with the maching knitting. 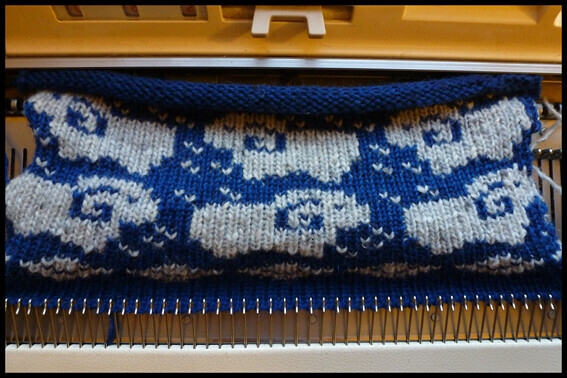 How many preset designs are there in your knitting machine? just curious. I’ve been thinking of machine knitting for a while, but because of lack of information I’m a bit sceptical. Isn’t it too hard to learn? And how wide are the opportunities to knit something with it. I need help mostly with my own design, I probably can program the pattern somehow? Does it make lace? Hi Ann! Thank you for reading. I’m really new to this myself too, so far I’ve just been using the manual to help, plus a course I found online here and the Ravelry group I mentioned in the above post – which is full of experienced machine knitters keen to help more people get into it! It still hasn’t totally grabbed me yet, I suppose I need to try making a garment or something first. Mine will make lace, but I haven’t tried yet! Hello. Just wanted to say that I also have a KH965 and am planning on getting to grips with it this week as I’ve had it in the loft for years and it has just been repaired. Do you know of any books or websites you have found useful when it comes to this model? I’m presuming you already have the 2 stitchworld pattern books for this model, I’ve just bought mine on a cd. Would love to keep in touch and be able to exchange advice.